It was nearly 100 degrees Monday afternoon when I tried to escape the sun in little Troy, Idaho's empty downtown on my way to pick blackberries in Kendrick. Without a pressing schedule, I wandered about exploring a bit looking for shelter inside a shop. Any shop would have been fine, but few places still exist among the empty storefronts and the sandwich place was closed for remodeling. My options came down to a couple bars and a state liquor store. I road the Vespa that day, so the bars were out unless I wanted to look like an idiot drinking a coke. Which I do from time to time. So, I escaped inside the liquor store to browse the “extracts”. Extracts meaning anything I think I can get away baking with. There were lots of fun options, but with a small trunk I choose just one. Something new to me, DeKuyper Luscious Red Apple Schnapps. When I got home, I threw around a few baking ideas, but in the end used the liquor to flavor this whipped frosting. It’s so good; I caught myself eating the darn stuff out of the bowl. Yikes! My only problem now is this giant bottle of brilliant red schnapps sitting in my ever growing liquor collection. In a large bowl, cream together butter, sugar and salt. Beat in egg and vanilla. Mix in baking soda and baking powder. Add flour and beat until just combined. With a mini cookie scoop (size 60), scoop out dough and place on cookie sheets 2 inches apart. Bake for 8 minutes or until no longer wet looking. Rest on cookie sheets for 4 minutes, then move to cooling racks. Once cool, thinly spread cookies with frosting. With a mixer, slowly beat together all the ingredients. Once combined, turn the mixer to high and beat for 3 minutes until fluffy. Spread frosting in a thin layer over cookies. Yield 2 1/2 cups. Prep time 7 minutes. I have never heard of red apple schnapps, but now that you have mentioned it...I'm on the hunt! I imagine that these cookies were a hit...how could they not be? They are pretty and tasty! Oh boy Laura this one sounds so good. Perfect way to use liqueur. I've got a few ideas rolling around in my head for ya! I've got this mantra going in my head "I will not go to the liquor store, I will not go to the liquor store," because you always make me want to get a fun licqueur for baking with! I love the things you come up with but I refuse to start building my own collection. I'm too cheap! Oooh, red apple schnapps sounds naughty but delicious :) And what's wrong with eating frosting out of the bowl? How else am I supposed to clean it? Ha that is funny. We have an ever growing liquor collection as well because now I tend to drink more wine instead so when you come to the house and see our bar room we look like a serious bunch of drunks. Good idea to cook with some of it. 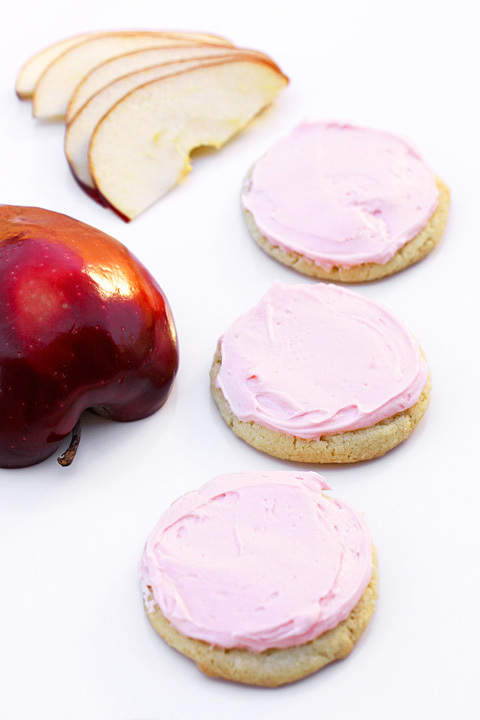 What a great treat...apple and sugar cookies together! It was great you were able to explore. Sometimes you just need that just to get out. Yum... That frosting sounds lovely! Perfect for the fall! ciao Laura!!! !favolosi questi biscotti...e le foto meravigliose!!complimenti!ciao! The apple schnapps sound intriguing and love the idea of the frosting. Laura, Your apple frosting sounds so unique. I think I'm going to change it out and use apple cider, and I'm sure it will taste GREAT! Thanks for the idea!